It’s been a rough week with meetings, deadlines, classes to teach. But, I made it through. I did not journal this week and I am feeling antsy and keyed up. Each day, I’d get to my job and realize, I’d left my nature journal at home. And every evening I’d return home, and forget to put my nature journal in my bag. Then I’d go to work the next day and realize… The whole week went this way. I usually journal on my morning tea break. I write down the weather and almanac information from the “local section” of the Philadelphia Inquirer newspaper. Then I write down what I notice on the way to my job. Well, this week the pages are bare and boy am I feeling it. I wouldn’t wish this situation on anyone. So, this post includes a nature photo I took a few weeks ago. 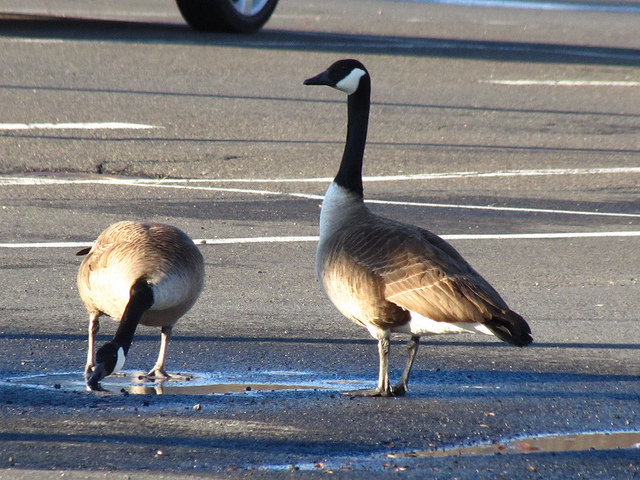 These Canada Geese are taking a drink from a puddle of water in a mall parking lot. A man tossed the birds some bread. For some reason this photo kind of sums up this past week. Canadian Geese in a parking lot.